How many times have you seen a mango salsa featured on a menu? This combination mimics those flavors exactly. To really ensure those Spanish nuances meld together nicely, Briscione suggests upping the amount of jalapeno in your pico, and nixing the onion completely. 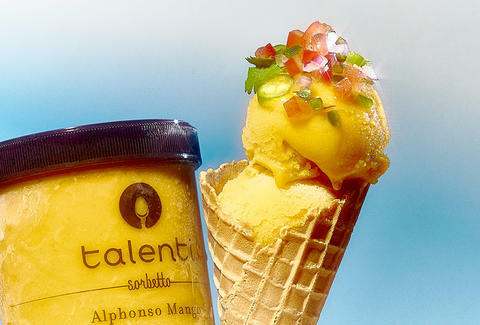 The heat from the jalapeno will bring some spice to the sweet mango (in fact, Talenti sourced the Alphonso mango from India for its flavor and sweetness), while the acidity from a bit of lemon in the sorbetto will complement the cilantro and tomato. We won’t blame you if you try topping salmon with it after. 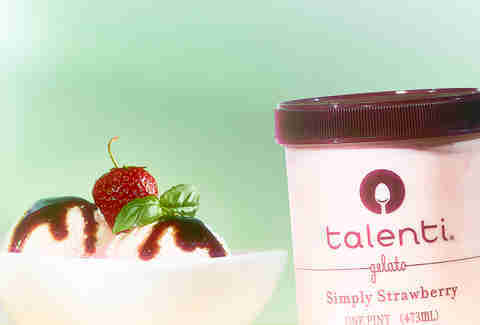 Topping a chocolate frozen treat with the last bits of potato chips at the bottom of the bag may seem like an overindulgence -- but because Talenti’s chocolate sorbetto is completely vegan, we say you get a pass. The salt from your favorite chips will also help amplify all the deep cocoa flavors in the sorbetto, Briscione says. “You can feel the salt making everything else that you’re tasting at the same time explode and become a bigger flavor.” So the next time you can’t decide between snacks, think: why not both? 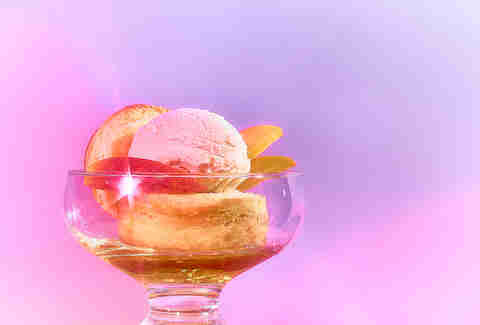 According to Talenti, the Cinnamon Peach Biscuit Gelato “tastes like a lazy summer picnic in Georgia.” Lazy summer days in the South also call for that other Dixieland favorite: bourbon. While bourbon obviously will taste like alcohol, it also can have notes of nutmeg, caramel, and cinnamon -- all of which are a perfect match for a peach gelato. We suggest you reduce the bourbon with some butter and sugar to turn it into a sweet sauce, then drizzle it on top for a new take on ingredients that exemplify “southern comfort.” Just spoon responsibly. Roasted chickpeas right now are all the rage, and for good reason: these spicy, crunchy, snacks are incredibly easy to make -- and just one can is enough for a crowd. So after your party, take a few of the leftovers and pop them on top the Mediterranean Mint Gelato. Briscione suggests playing up the Middle Eastern spices on the chickpeas to get a truly interesting bite: “If you look at Middle Eastern cuisine or Indian cuisine, where mint is paired with curry spices, mint is paired with cumin and coriander and turmeric -- then it could really work.” Leave flavors like garlic out of the equation, but do spice those chickpeas with a mixture of those spicy, Middle Eastern flavors before you pop them in the oven. Briscione says they are a blank canvas, lacking a ton of flavor without it. Lavender is a floral tasting herb that’s been relegated to bathroom candles and sleepytime aromatherapy. We say no more -- and that this complex herb deserves a spot in your desserts. Vanilla bean is its perfect match, Briscione says, because the two aromas are actually complementary. “Vanilla is a flower, also,” he says. “So after the aging and the curing and everything that vanilla goes through, it develops these deeper, more complex, and smoky aromas.” Once vanilla is combined with milk, as it is in this gelato, Briscione says a lot of those creamy, milky aromas also come through. “Milk is a very accepting canvas for floral aromas and floral flavors,” he says. 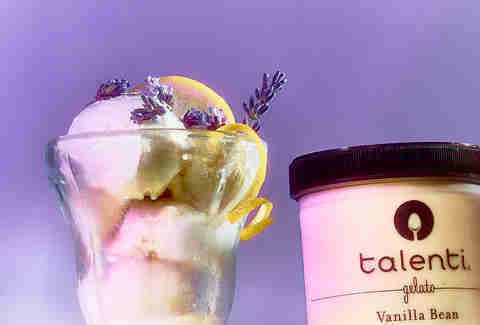 “So, lavender and vanilla are great matches in anything milk based.” A squeeze of lemon will also add a touch of acidity (and even perceived sweetness) to all those floral notes, too -- but if it’s too strong, you can forego it; Talenti’s Vanilla Bean flavor actually has a hint of lemon in it already. For those based in the Northeast, topping a slice of apple pie with a bit of sharp cheddar cheese is the only way to enjoy America’s most American dessert. Even in its ice cream form, this tart confection can benefit from the salt and fat in a bit of cheddar. What exactly is the draw to top a pie with cheese? Briscione says that’s because apples grow well in northern climates, and those places tend to be cheese producing climates as well. “A lot of aromatic compounds and flavor is derived from environment,” he says -- adding that this is basically the “what grows together goes together” concept in action. He suggests crisping up the pieces of grated cheddar on a baking sheet before topping the gelato if you want to add a bit of extra crunch. If you have the time, you can also turn those grated cheddar bits into a small baked cheddar bowl for your gelato by using a muffin tin to form the shape. Could cheese bowls be the future waffle cone? We think yes. The combination of cheese and fruit can make your charcuterie board sing, so you know it’s going to work in your ice cream pint -- and transport your after-dinner indulgence to something worthy of a restaurant dessert menu. Feta is a classic topping for salads with fruit (think spinach salads with cranberries, or even a watermelon and feta salad) thanks to one component: salt. Feta is one of the saltiest cheeses out there -- and it gives a sweet, fruit based gelato like the Roman Raspberry another layer of complex flavor. “Feta is just a vehicle for salt,” Briscione says. “Salt also amplifies flavors. We always teach our students [to] keep adding salt to something until it stops tasting better.” If you’re one of those people who aren’t into soft textures, though, he suggests grating a little pecorino cheese on top of your ice cream scoop instead -- it’ll have the same effect. This combination is essentially the summer version of a Mexican style hot chocolate -- and there is a reason these two flavors find their way into two confections. “You’re getting your mix of tastes,” Briscione says. “So you’re getting sweet and bitter, and spicy and salty as well. From a chef’s perspective, the goal in assembling a bite is to first hit as many of those different tastes as you possibly can.” That’s really what makes this combination especially tasty. As a secondary point, he says these two ingredients also work well together thanks to their aromas. Chocolate contains several different aromas, but most important in this instance is its fruity notes. Peppers, even though we normally can only taste spice and heat, have mostly fruity aromas as well -- and items with similar aromas, even if they don’t seem like they should pair, normally work well together in a dish. Sweet and slightly salty popcorn is one of the most addicting snacks of all time (thanks to how your brain responds to sweet and salty combos). All it takes to turn that classic snack into a sundae is two scoops of gelato and popcorn. The Southern Butter Pecan Gelato is made with butter roasted pecans, while the Salted Peanut Caramel adds the sweeter contrast to legumey goodness. Put a scoop of each in a bowl, and top them generously with salty popcorn to give dessert a texture that bridges the smooth ice cream and its nutty crunch. You’ll have a snack worth enjoying during the next summer baseball game. This is the dessert version of a caprese salad, and just like the elements of a caprese salad combine to form a near perfect bite, these flavors will also make your palate do a happy dance. Basil, Briscione says, has nearly identical botanical elements as mint. In fact, if you taste them both side by side, you’ll only be able to identify the basil thanks to its tinge of savory flavor. “Basil works anywhere mint would work, and mint works well anywhere basil would,” he explains. To avoid having your gelato taste too much like, well, vinegar, we suggest reducing that balsamic down on the stove until it turns into a thick sauce with a sweeter profile. On top of gelato, it plays a similar role to caramel sauce -- making this the grown-up version of a sundae. In addition to raspberry working with a bit of basil, it also plays well with an earthier spice. 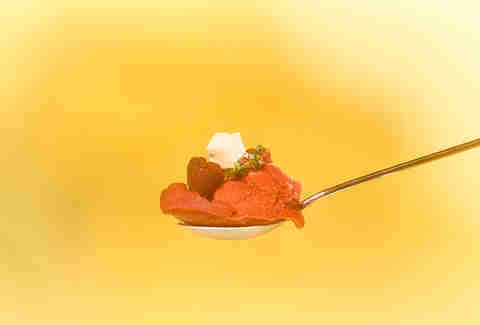 A slight dusting of cumin on top of a raspberry gelato will actually invoke more mint flavors, Briscione says. “One of the main flavors in cumin comes from a compound called carvone and that compound is the mirror image of the compound that’s responsible for pure peppermint extract.” The result, he says, is that cumin may actually add a mint-like element to your dessert without any of the breath mint-like tastes normally associated with the herb.